Hello it is time for my Monday Design Team make for Visible Image. I have been beavering away in my studio over the last week making some samples, which you may have seen on Mark and Helen’s Facebook live video. 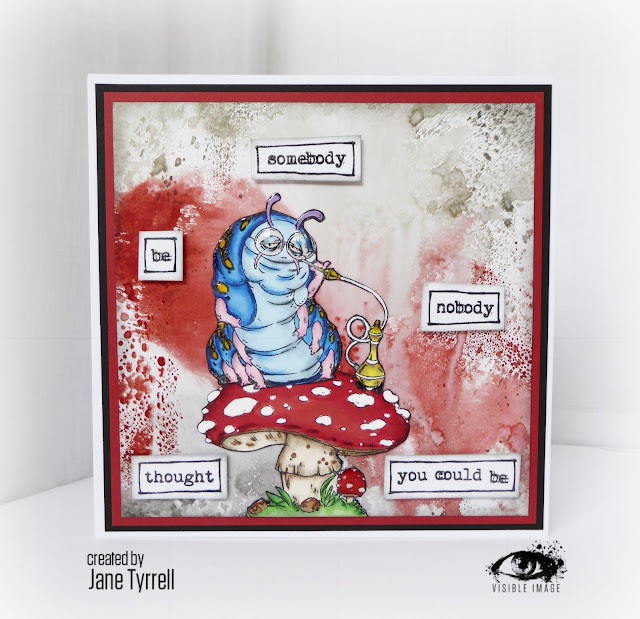 Today I am delighted to be sharing my first sample I made using the amazing Mr Caterpillar. I know we shouldn’t have favourites as they as all amazing, but I have such a soft spot for this cutie. I love colouring images and decided for my first samples that I would get out my much loved and well used Promarkers. 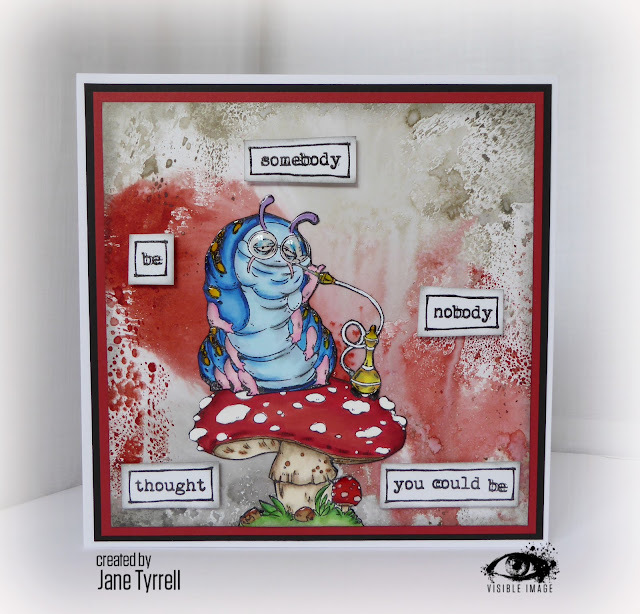 I stamped The Caterpillar and his amazing toadstool onto smooth card stock and coloured them. We laughed during the live Visible Image Facebook video as to whether this should be called a mushroom or a toadstool. I have always called anything bright red and poisonous looking a toadstool. My colouring takes me back to my Enid Blyton, The Folk of the Faraway Tree, childhood reading. So I decided to look this up and Google states that the term mushroom and toadstool are pretty interchangeable, they are both used to describe types of fungi. However the term toadstool tends to be used when the fungus is one that is poisonous and therefore inedible. I think my toadstool looks pretty inedible to me! 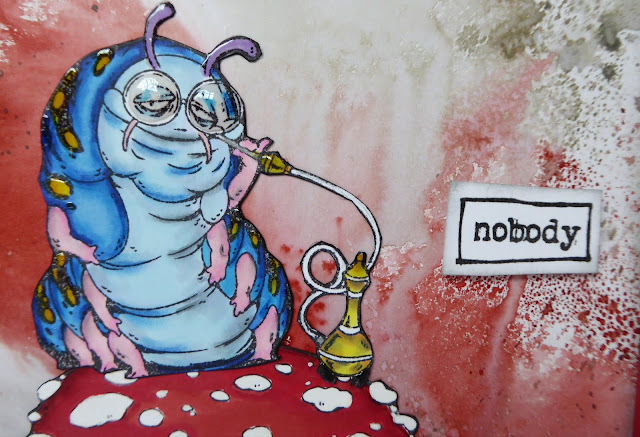 I then highlighted my images with Prismacolor pencils to add some shading (you can see this further down in my finished card). I stamped and cut out the words and added glossy accents to make his glasses shine as well as his spots. Hmmmmm…I think any more relaxed and he would be falling off his toadstool! I really love this new stamp set, and I think he is going to go down a storm in the crafting world. 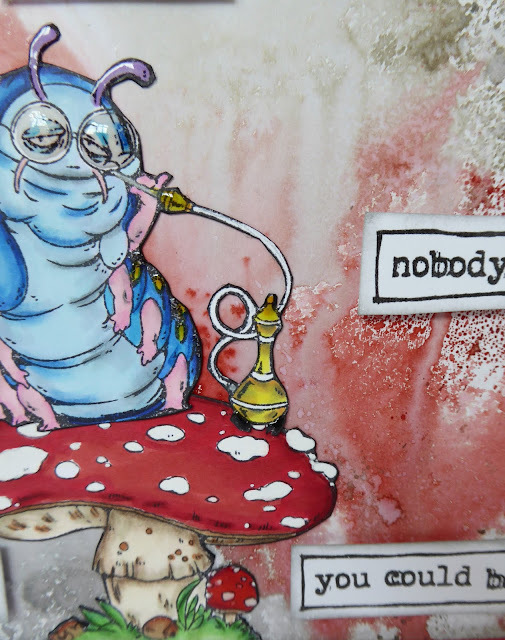 Pre-release orders for all the Wonderland stamps and also 2 brand new stencils can be make now over in the shop. Thanks so much for stopping by and for your very kind comments. Our summer sunshine continues as does my garden studio creating. We will be back tomorrow with some brilliant musical inspiration from Lisa Taggart! 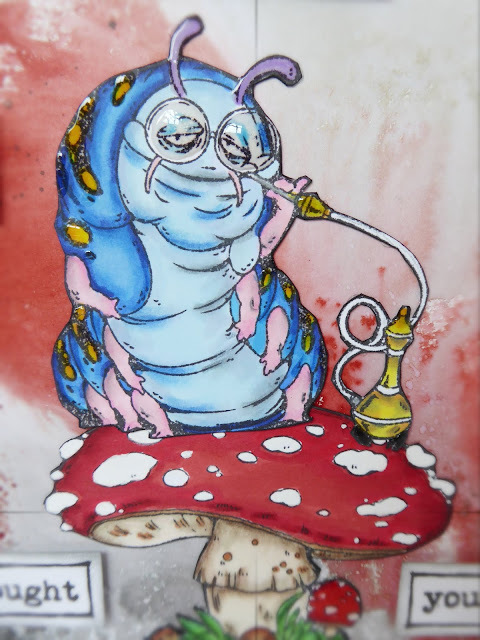 This entry was posted in Alice in Wonderland. Bookmark the permalink.